These Bloomin ballistics are made from a mix of annual and perennial wildflower seeds and 100% post-consumer/recycled paper - just throw and grow! Make sure your target is tactical (somewhere that will receive consistent watering). So go ahead - bomb highway roadsides, sidewalks, medians, vacant lots, or even sabotage your own backyard. Packs of 6 bombs come in a clear cello bag with full color customizable header. Click here to view our Stock Seed Bomb Colors. Product Details Specifications: SBC6 - 6, 1" seed bombs; header card Size/imprint area: 2x3.5" folded; Bleed: 0.125" | See Art Guidelines Stock: 100% Recycled 100# Cardstock and seed paper shape Printing: Full-color, Earth-friendly CMYK | See Printing Information Custom Options: seed mix | cardstock Turnaround time: 5-7 business days from art approval to ship date | Rush service available SBC 6 Qt. 100 250 500 1000 2,500 1-sided each $6.00 $5.50 $5.10 $4.80 $4.50 All Pricing (A) • SET-UP CHARGE $35 (G) for header. 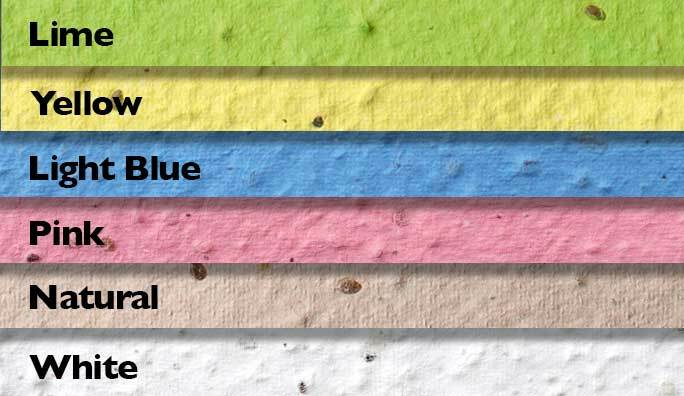 Stock colors: Yellow, White, Natural, Pink, Lime and Light Blue (all wildflower). Custom seed mix and/or color: $63 (G) fee, 250 qty min per color/mix. *Samples below are not stock artwork. All Pricing (A) • SET-UP CHARGE $35 (G) for header. Stock colors: Yellow, White, Natural, Pink, Lime and Light Blue (all wildflower). Custom seed mix and/or color: $63 (G) fee, 250 qty min per color/mix. *Samples below are not stock artwork.